A basic definition search of the difference between needs and wants turned up the following “The difference between needs and wants is really quite simple; need is something you have to have and want is something you would like to have.” The explanation that followed went on to say that “In actuality, a person only NEEDS four things to survive which include; a roof over your head, enough food and water to maintain health, basic health care and hygiene and enough clothing to remain comfortable.” Perhaps that is true for most people but what about a person with an intellectual or developmental disability who NEEDS their direct support professional (DSP)? For thousands of people with I/DD basic needs are more far-reaching than a roof over their head, enough food and water, basic health care and clothing, yet many of the services provided by DSPs are often treated as wants rather than needs. For some people, the ability to meet their most basic needs depends entirely on having a quality DSP who knows what their actual needs are. What happens to meeting a person’s most basic needs when the person they need just can’t afford to do it? Do you tell them “I would love to support your efforts to get out of bed today, to get dressed today, to go to the bathroom today, to eat today, to get to work today… and on and on… BUT I just can’t afford to do that.” The services and supports provided by DSPs are not luxuries they are necessities. If DSPs really are the “BACKBONE” of our system, as we have heard so many people say, then let’s treat them like it. Let’s RALLY and make some noise and keep making noise until we are so loud that we can’t be ignored. 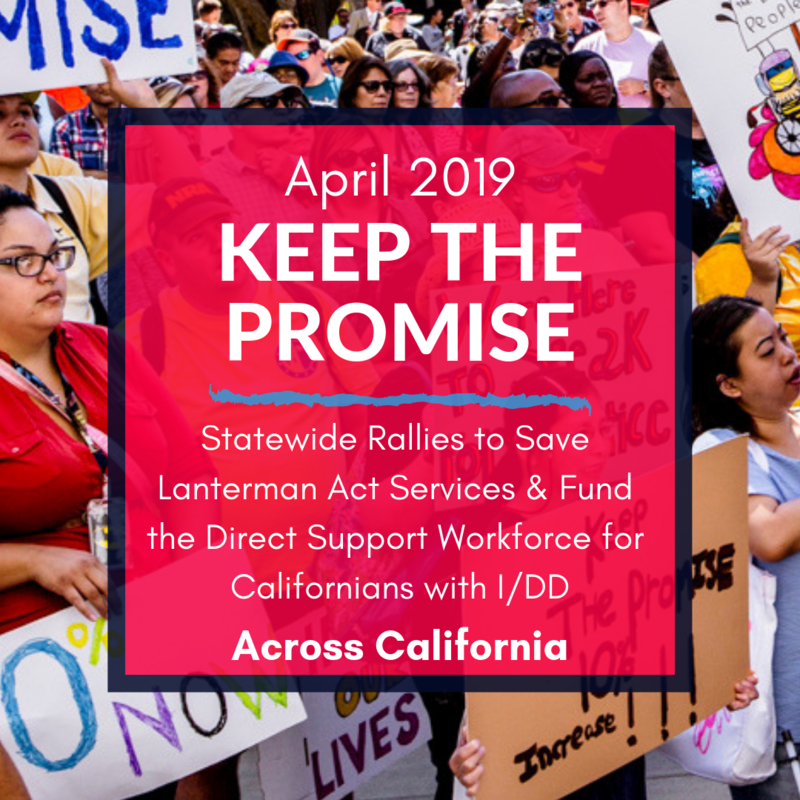 This is a CALL TO ACTION for everyone who is, knows, needs and values DSPs to join us in advocacy efforts to address the DSP Workforce Crisis because LIVES DEPEND ON IT! There are so many ways to get involved and make a difference in advocating for a strong DSP Workforce. The ANCOR FOUNDATION and UNITED CEREBRAL PALSY have published the 2019 Report The Case for Inclusion in which they highlight the magnitude of the DSP Workforce Crisis. Read it, become knowledgeable about the problem and advocate!